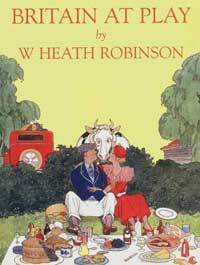 William Heath Robinson was an important English Cartoonist & Illustrator who also became a household phrase, "Heath Robinson" as a result of his fanciful and intricate drawings of impractical creations. He lived in Moss Lane, Pinner for 10 years and there is a blue plaque on the house where he lived. However, up until now there has not been a gallery or museum in the world with an exhibition of his drawings. West House in Pinner Memorial Park was once the home of the grandson of Lord Nelson and Lady Hamilton. The people of Pinner bought it after the Second World War to be a permanent war memorial and centre for the community, but it fell into dereliction. The West House and Heath Robinson Museum Trust raised £1.5m to restore the building and reopened it in 2010 with an upstairs function room, shop and small Heath Robinson gallery, a very popular café, Daisy’s in the Park, and Synergy, a complementary health practice.